Charles Bukowski to Robert Bly (c. 1966). 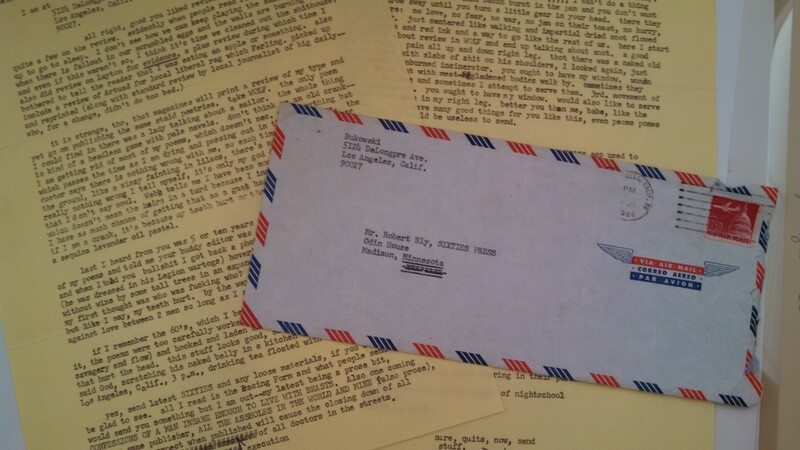 Back in November, I wrote about two letters from Garrison Keillor and Bill Holm I found in the University of Minnesota’s Robert Bly Papers. What I didn’t note is that I also found one from writer Charles Bukowski. Pulling it out of the stack was a surprise — though it shouldn’t have been given Bly’s stature in the literary world at the time — and so I made a copy of it thinking Buk’s may be interested. It’s not as big of a literary event as the discovery of Neal Cassady’s “Joan Anderson letter,” but it does include an unpublished poem. In the article I wrote to accompany the letter’s publication in Empty Mirror, I note that both Bly and Bukowski were literary outsiders disdainful of what the former called “university poets.” The 1960s were a different time, and lacking the small press culture, I wonder whether they could gain such widespread prominence today. I’m doubtful. In terms of its modern relevance, [this letter] should inspire reflection over the state of writing nearly a half-century later. In an environment where young writers are only taken seriously if they have an MFA and are competing for dwindling print-space, could another Bukowski gain traction? Can a writer survive outside the university, “scratching his naked belly in the kitchen”? It is hard to imagine. Read the full article and letter here.